A POEM A DAY: Also known as You Who Forgot Poetry. 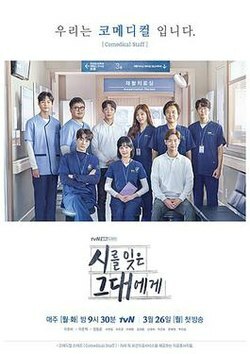 This is a Medical South Korean television drama series starring Lee Yu-Bi, Lee Joon-Hyuk, jang Dong-Yoon and Lee Chae-Young. This Drama series is most popular since it released. The series aired every Monday and Tuesday at 21:30 (KST) on Distributor tvN channel from March 26th of 2018 to May 15th of 2018. It is romantic medical drama series which will make you fall in love with the story and its cast. The story of this drama revolve around a young physical therapist who wanted to become a poet and use poetry to express her feelings and love to others, but due to her poor family background she studied to become a therapist. Every character of this drama is key to the story telling. Original Release : March 26th of 2018 to May 15th of 2018. The story of this drama revolves around a young physical therapist Woo Bo-Young who wanted to become a poet and uses poetry to express her feelings, but due to her poor family background she studied to become a therapist. Woo Bo-Young falls in love with her senior Dr.Ye Jae-Wook, but in between her college crush Shin Min-Ho who shows up as a trainee to her Physical Therapy department for whom she did every single stupid thing to impress when she was in the college. The comical scenes are truly hilarious and of good natured humor. The drama did not solely revolve around the main leads but also the struggles of the other characters as well. EPISODE 1: Flowers That Bloom When Shaken. Woo Bo-Young finishes her work with the patient. She had 30 minutes break before the next patient, but her senior Park Shi Won told her to treat his patient for him. So she had to do that. The downfall was that she was merely a contractor without much time left and another one was her juniors didn’t listen to her even though she was their senior. When she gets back home from a day of hard work she totally get exhausted, but still she doesn’t have a time to rest because she lives with her work superior Kim Yoon Joo who was less hygienic. It was like she is at work 24/7. The most beautiful flowers in this world all shake as they bloom. As they shake, their stems straighten in an upright position. On the next day Shin Min Ho and Kim Nam Woo attend the hospital as physical trainee. There was awkwardness between Woo Bo-Young and Min Ho because they were from same health university and Woo Bo-Young was madly in love with him in her past. She did every stupid thing to impress him but he had rejected her feelings. Woo Bo-Young’s senior Park Shi Won makes her to teach the new trainee, that was the hard task for her to deal with that situation. Nam Woo promises Woo Bo Young that he won’t tell anyone about their matter to anyone. On the afternoon their chief Yang told everyone that he got call from the customer satisfaction committee and they told that Woo Bo-Young is friendly employee of the year at their hospital. She was the one who received the most recommendation cards from patients. She was so happy because of her selection for friendly employee. They gave her the recommendation cards which were written by her patients. Woo Bo Young and Min Ho were totally acting like enemies of each other. Min Ho didn’t want to get along with her so he kept ignoring her every time. She told him to not to mess up with her and co-operate with the work. Woo Bo Young’s seniors wanted her to give them a party because she was selected as friendly employee. When they all were parting Woo Bo Young’s senior got call from the department and informed that they cancelled to make Woo Bo Young friendly employee because they wanted a full time employee for that post. She was so happy and her seniors were fell sorry to tell her about it. Finally her roommate senior Yoon Joo told her about the cancellation of her post. She felt embarrassing and sad because of that news. She also found out that everyone new about her past with Min Hoo and she thought that was him who spread rumors about her but Nam Woo was the one who told them all about it. That voice, which happened to call my name. I stayed up all night dreaming about that one gesture. And I fantasize about our future because of your smile. I shattered to pieces as if I was sunlight. Woo Bo Young left the party and went to the park where she reads the card which were written by her patients. She cried a lot while reading them. Nam Woo told Min Ho that he was the one who told everyone about his dark past with Woo Bo Young and also promised that he will resolve the misunderstanding in between them. - By Oh Bo Young. I untangled the twisted knot. I also took out the thorn. I straightened out my position. I let the twisted relationships go. I erased yesterday with the hope of a better tomorrow. Woo Bo Young’s senior Yoon Joo feels pity about her. She thinks that Woo Bo Young is deeply hurt because of Min Ho makes her angry on Min Ho. After some days a new sling doctor Ye Jae Wook gave a great seminar at their hospital, he also joined in the day after that seminar. He is has great skills also known as the top Korean Doctor in sling therapy and his qualifications were unbelievable, he’s qualified to lecture all over the world. He also published multiple papers on SCI. But he was also a Advice machine who gives advice to everyone. Nam Woo tells everything to Woo Bo Young that he was the one who opened up everything about Min Ho and her back in the college and also in their department. Woo Bo Young feels sad to attacking Min ho for the whole thing. The new sling doctor Ye Jae Wook reads the poems which were posted on the department board. When he meets Woo Bo Young, he gave her a patient card which he found it at the park. At times, I regret it. Might have been a gold mine. Could have been a gold mine. And talked to you more. As if I was hard of hearing. As if I was absent-minded. I should have loved those moments more. Every moment is like a flower bud. A flower bud that blooms when I’m eager. EPISODE 3: I Like You. Woo Bo Young resolved every misunderstanding with Min Ho. Doctor Ye Jae Wook’s presence in the department made everyone curious. Dr. Park told Woo Bo Young to finish his paper work for the staff lecture. Dr. Ye jae Wook asked Woo Bo Young to present the staff lecture since she gathered all presentation material. She was so happy because she got an opportunity to represent herself at the staff lectures. Dr. Ye jae Wook saved Woo Bo Young from a troublesome, violent patient who faked his injury. At the staff dinner everyone acknowledge her that she is on the Ye Line now on because Dr. Ye did a lot for her. Woo Bo Young got disappointed because Dr.ye couldn’t come to the dinner. Woo Bo Young get too drunk and send a huge message to Dr.Ye with a poetry. On the next morning when Woo Bo Young wakes up from her hangover she realized whatever she has done last night. She feels so embarrassing to go to the department so she started avoiding Dr. Ye. She thought Dr. Ye will get mad at her because of her mistake. She apologies about it and promises that she will only show him good side of her. On the next day all the department staff went to the village site for the camp. Woo Bo Young tries hard to show her good work to Dr. Ye but that wasn’t her day. Everything was going wrong with her. EPISODE 5 : It’s Okay If You Don’t Love Me. Dr. Ye asks Woo Bo Young to help him in his lecture. After that he also buys her food for thanks giving. She started imagining her relationship with Dr.Ye all the time. Woo Bo Young’s work superior Kim Yoon Joo was so happy knowing that Dr.Ye bought her food and dropped her off. She started to tell her that he is started to making love moves on her which made her shy. Kim Yoon Joo had doubt about Dr.Ye so she asked him about a blind date but he said he doesn’t want to date in same medical field. Everyone was shocked because of that. The junior trainees told everyone that he had girlfriend at his former hospital where Dr.Ye worked. There was an accident happened to a patient during the surgery made him lose his life. The patient’s relative throw a case against the doctor but that doctor tried to cover up the truth at any cost. Dr.Ye was the only one who stood on the patient’s side. After that, he had a hard time working at the hospital but he was able to endure it all because of his girlfriend at the same hospital. But he found out that his girlfriend had another man. But that man happened to be the doctor he fought against at court. He managed to endure the lawsuit and pressure from the hospital and quit his job and came to their hospital. Woo Bo Young decides to not to like Dr.Ye. Min Ho mistaken that she is hurt because he reject her and because of that she is sad. Woo Bo Young gives one poetry book to Dr.Ye to get through the pain. Min ho reads the text of Dr.Ye from Woo Bo Young’s phone accidently which made him believe that Woo Bo Young likes Dr.Ye not him. He found that Woo Bo Young has send a book of poetry to Dr.Ye. Min Ho remembers that Woo Bo Young also used to send him poetry papers when they were in the college. He asked her why did she do that to Dr.Ye, She accepts that she likes Dr.Ye and will try to show only good side of her to him. Min Ho seems relived that Woo Bo Young doesn’t like him, but deep inside he was disappointed. On the next morning when Min Ho saw Woo Bo Young cleaning Dr.Ye’s cabinet he remembered that she used to clean his car in the college without letting him know. Woo Bo Young started to take care of Dr.Ye and that was making Min Ho jealous about him. Min Ho got a call from his mom who wanted to come back home for the dinner to celebration. His mom even made a buffet reservation for their family. Min ho realized that his birthday was on that day that’s why his mom called him for dinner. Woo Bo Young also wanted to go home because her mother was sick. Min Ho gives her a ride to her home since they had same destination. When Min Ho visits his family at hotel. He realizes that they hadn’t any idea about his birthday even they called him to celebrate for his big brother’s successful achievement but not for his birthday. He got angry and left the hotel. By - choi bum young. Woo Bo Young sees Min Ho eating Ramen at the retail shop she asked him about that. He told her everything. Woo Bo Young feels pity for him. She took him to the buffet and tells him to choose whatever he likes. She also prepared birthday cake for him. EPISODE 7: The Cricket and I .
Dr.Ye wanted to film a treatment footage for the staff lecture. He asked his junior to help if they could. Woo Bo Young agreed to help him with Min Ho since she wanted to make close with Dr.Ye. A VVIP patient came from Dubai to the department to get treatment from Dr.Ye since he was the top sling therapist in Korea. That patient wanted to see Dr. Yoon Joo. He also send flowers for her, but Chief mistook it with Woo Bo Young. Everyone was so surprise with it which leave Woo Bo Young embarrassed. Dr.Ye comfort her and told her not to feel embarrassed. Dr.Ye wanted to treat Min Ho and Woo Bo Young because they helped him to film a treatment footage. He took them to Yoon Dong Joo’s literature museum. She feels happy when Dr.Ye told her that he really feels comfortable because of the poetry which she sends him time to time. Finally Min Ho gets really drunk at the dinner and tells everything about her and his past life to Dr.Ye, he also told him that he rejected her proposal. EPISODE 8: The Point Of No Return. Woo Bo Young scolds Min Ho because he opened the past in front of Dr.Ye. Dr.Ye asked Woo Bo Young to have a lunch together to cheer her up because she looked upset. Woo Bo Young was so happy because Dr.Ye asked her out for lunch. Min Ho admits that he loikes Woo Bo Young to his friends left them surprised. EPISODE 9: The Point Of No Return. On the next day their chief announced that he is going to resign and join the new hospital which will leave a free spot for a full time employee. He also told Woo Bo Young that he will recommend her to get that position. Everyone cheered her up because she was going be a fulltime employee soon. Dr.Ye accidently heard Woo Bo Young talking about her love for him. She wanted to clear the things but she confessed her feelings in front of him. Dr.Ye told her to meet in private after work. Nam Woo encourages her that Dr.Ye will accept her feelings. At the staff dinner their chief got a call from his supervisor he told him that he will be no longer transferring to the another hospital and because of that Woo Bo Young loses her chance to get the full time position. She gets embarrass because of the disappointment. Dr.Ye called Woo Bo Young to have a talk. He told her that he is being sorry because he can’t accept her feelings. He had made up his mind from start to not to date anyone from the same field. She got hurt badly. She thought that she did wrong with Dr.Ye whose heart wasn’t healed. Min Ho got worried about Woo Bo Young. He found her at the park of the bench and comforts her. Woo Bo Young told him that she get rejected by Dr.Ye ant that’s the hardest thing to overcome. EPISODE 10: It Only Rained After You Left. Woo Bo Young decided to act like nothing happened. She didn’t want to know Dr.Ye that she is having hard time. She cried all the time so everyone thought it’s because of she lost her chance to be a full time employee. Their chief told Dr.Ye that Woo Bo Young is very disappointed and hurt so he would like to resign and give his position to Dr.Ye where she could be a full time employee. Dr.Ye talkt to Woo Bo Young and apologized for whatever happen to her. She told him not to fell like that way. She wanted him to not to be caring towards her and asked him to not to treat her well from onwards. Min Ho’s roommates cheered him up to take a step towards Woo Bo Young since she got rejected by Dr.Ye. And comfort her to make his side safe. They suggested him to take her out at the beach and appeal to her by being nice guy. They went to the beach with Woo Bo Young but she was continuously thinking about Dr.Ye. EPISODE 11: What A Fool You Are. Woo Bo Young’s patient doesn’t wanted to get treated instead he gets angry on her. Dr.Ye tells him that if he doesn’t want to come for treatments then he will talk to the chief and cancel his all treatments. Woo Bo Young doesn’t like Dr.Ye’s opinion towards her patient who gave up on his dreams because he got into the serious accident. Woo Bo Young told Dr.Ye that he is Cold hearted towards the patient but she will keep her patient convincing him to come for the treatment. Dr.Ye Talk to that patient and apologized for being rude to him. He also convinced him to come for the treatment. Woo Bo Young heard this all from that patient and felt sad. Min Ho gets success finding a poetry book which Woo Bo Young wanted to buy. He wanted to give it to her and tell her about his feelings towards her. Woo Bo Young called Dr.Ye over and apologizes for carelessly telling him that he wouldn’t know how much it hurts to give up on a dream when Dr.Ye own gave up on his dream to becoming a baseball player. She also told him that she loves poetry and wanted to become a poet but because of her financial situation wasn’t good she gave up on her dreams. Min Ho also called Woo Bo Young and tells her that he wanted to say something and he started to run to meet her. EPISODE 12: A Poor Love Song For The Young Person Next Door. Dr.Ye confesses his feelings to Woo Bo Young and asked her to date him because he likes her a lot and can’t let her go because of his past. Min Ho couldn’t meet Woo Bo Young because he got into an accident. Woo Bo Young told Dr.Ye that she wanted to keep their relationship as secret. She thinks if people find about it then it will get uncomfortable for both of us and they also started to talk about them. Dr.Ye gets agree about her thoughts. Dr.Ye takes good care of Woo Bo Young at workplace every time which made everyone surprise. Min Ho wanted to book a table at nice hotel to confess his feelings to Woo Bo Young. Woo Bo Young told Dr.Yr that everyone figured out that he is dating a girl and thinking about it all the time. Woo Bo Young and Dr.Ye took a long walk. He told her that he doesn’t want to put her in difficult spot so he will be more careful. Dr.Kim who was the section chief of rehabilitation medicine joins Physical therapy department. He had lots of experience and good skills also a pure and open minded towards his patients. Everyone from the department was impressed by him. He acknowledged Woo Bo Young’s opinion in the staff meeting which impressed her and she was also thankful for that. Dr.Ye wanted to take Woo Bo Young to the musical. He also buys tickets. Dr.Ye asked Section chief Dr.Kim to take care of himself because he seemed tired because of working a lot. He also asked him to visit Physical therapy department often to get treatment. On the next day Dr.kim collapsed and moved to the bedside treatment. Woo Bo Young took good care of him. Every single patient of Dr.Kim was worried of him which makes him weaker. Woo Bo Young gives musical tickets to Min Ho and went to visit Dr.Kim where she sees Dr.Ye giving him a special treatment. I leave my heart to setting sun. And feel sad due to countless thoughts. And tell you that everything will be okay. I fell like there is more that I can do for you. I feel sad for your heavy shoulders and long days. I hope you unload your burdens and become happy again. I earnestly pray for it. On the way back home Min Ho sees Woo Bo Young and Dr.Ye together which brakes his heart. Min ho asked Woo Bo Young if she is dating with Dr.Ye. She told him that it started when Min Ho wanted to tell her something. She asked him to keep it as a secret since he was the only one who knew about her relationship. On the weekend the physical therapy department arranges the group trip. Min Ho wouldn’t lose any choice to take revenge on Dr.Ye, but Dr.Ye beat him with his perfections. Dr.ye asked Min Ho to be polite to Woo Bo Young since he saw him to harass her every time. Min Ho told him that he likes Woo Bo Young and will try everything to get her back. Dr.Ye asked Min Ho to get over Woo Bo Young because he is dating her. Min Ho threw away Woo Bo Young’s bracelet which was gifted by Dr.Ye. Woo Bo Young got mad at him and told him to act as man. She told him that she doesn’t want to see his face in the future life. EPISODE 15: I thought it was okay for mothers to do that. Min ho decides to be remain as friends with Woo Bo Young. TV production team came to Physical therapy department to take Dr.Ye’s interview. Dr.Ye suggests Woo Bo Young’s name to film a therapy video for the Production team. Woo Bo Young was so happy because she got opportunity to come on TV. But the director of the Department told their chief that he wants Dr.Kim to help Dr.Ye not Woo Bo Young because she is not full time employee and could be transfer to the another Hospital after the contract ends. Dr.park went to drop his mom to her village house. She was living with his family but when his Wife lost her job there expenses couldn’t handle by him. He was worried about his mother. Dr.Kim fells worry about Woo Bo Young so she finds a full time job opportunity for Woo Bo Young. She told Woo Bo Young to go for the interview. Woo Bo Young asked Dr.Kim to keep it as a secret. Woo Bo Young told Dr.Ye that she needs to go home to see her mom so couldn’t be by his side while filming the show. Woo Bo Young went for the interview. When she found that they never intended on hiring anyone when they already decided on someone she left the interview. Dr.park cancels automatic transfer to his mother as per saying of his wife. He found a letter of his mother in which she had wrote that she had been saving money for her twins grandsons. Dr.Ye found out that Woo Bo Young went for that interview and also searching for the job. Min Ho confesses his feelings to Woo Bo Young in front of Dr.Ye, but Woo Bo Young told him to talk later. Woo Bo Young told Min Ho that she likes Dr.Ye and will pretend that she didn’t hear anything from him. Dr.Ye wanted to make everyone comfortable around him. He started to help his juniors and started to become close to them. Dr.Kim wanted Woo Bo Young to get full time job so she told her to talk to Dr.Ye so he can convince the director and hire her as full timer. But she refused to ask Dr.Ye for that. Woo Bo Young told Dr.Ye that she will find job on her own capabilities and will work hard for that. Min Ho told Woo Bo Young that he will get over her and do not disturb her personal life with Dr.Ye. The section chief told everyone that there is a empty place for full timer and the director wants Woo Bo Young to stay and work as employee. But Woo Bo Young wasn’t sure about it. They notify Woo Bo Young that she is now full time employee at the Physical therapy department. And finally Woo Bo Young becomes full time employee. Just like the name of this drama it really beautifully described poetic vision. I think every episode of this drama has a good poetry, humor, pain, happiness which will make you to curious about the next episode without being overly dramatic. The loveable and poetic story telling of this drama will make you fall in love with each and every character which is a key of this story telling. This drama feels like a breath of fresh air that will fill you with a lot of warmth and happy feeling. It’s really worth to watch this drama.